JEWS ARE THE MOST NEUROTIC people walking the face of the earth. 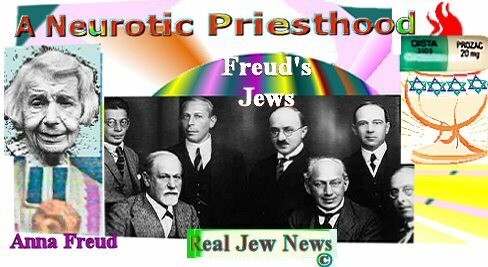 And these 5 Jewish “psychiatric” leaders and their Jewish pack of neurotic shrinks pretend to be the “priests” of a New World Order. THE JEW SIGMUND FREUD visited America in 1909 to give lectures at Clark University in Worcester MA. Freud soon established an “elite” - an “apostolic succession.” This “succession” began with the Jew, Alfred Adler (1870-1937) who in 1932 established a psychoanalysis professorship at the Long Island College of Medicine in America. Adler, as a transmitter of Freud’s teachings, promulgated “bisexuality” as a means of healing childhood conflicts. And thus the Gay Rights Movement was born from the perverted mouth of the Freudian Jew Adler. The Jew, Erik Erikson (1904-1994) continued the “apostolic succession” in America reaching the pinnacle of his career by being one of the first Jews to take a professorship at Yale University in 1936. The Freudian mantle passed to such Jews as Erich Fromm (1900-1980); Otto Kernberg (b 1928) of Cornell Univeristy (b 1928); Anna Freud (1895-1982), Freud’s daughter); and New York Jewish glamour boy, Roy Schafer, (b 1922) author of A New Language for Psychoanalysis. And what is the “new language” that these high priests of Freudian psychology promote? A) Confession; B) Absolution C) “Holy” Communion. 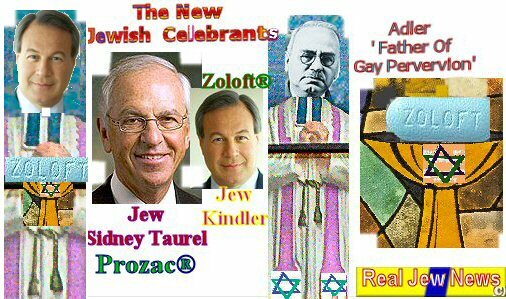 Prozac®: Celebrant, Jew Sidney Taurel, President of Ely Lilly Here. Effexor®: Celebrant, Jew Robert Essner, Chairman of Wyeth Pharmaceuticals Here. — “Is it possible that we are developing the equivalent of a secular church? I too found out about you from Rense and I’m going to link you to my site if you don’t mind…Thanks for the information. I discovered your site through Rense some time ago, and have been making my way through the many great articles here. This is a late comment on an article written some years ago, but I just wanted to drop you a line to say that this article has confirmed what I’d long sensed about the psychiatric profession (and much of the established medical profession as well)- that it operates like a perverse secular religion. It always gave me the creeps, and I have been enjoying a happy healthy life without all that. Thanks again for confirming that my instincts were telling me the right thing. You have most documented fact of this category in the entire world. Isn’t that incredible to be able to say with the meat to back it up just a click away. This should be mandatory for all High School students before graduation. It’s not the “Jews.” It’s the tiny percent of the traditions of the elders Jews who since they don’t love God but man’s words and doctrine, that makes them Luciferians out in the open. They worship men over the written laws of Moses, instead they are Noahides of the Talmud Traditions of the Elders. 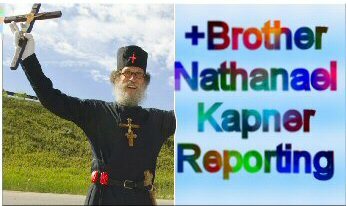 You, Brother Nathanael, are a rare man and your parents should be proud to have such a talented son and one that is fearless and battle with the most powerful force of all time. Do they realize that you go straight at them with hard facts and love and do it better than anyone else? Brother Nathanael,I honor you Sir. I really do. I fell in love with Christ because his kind, wise words stole my soul from the selfish darker side. I couldn’t believe the words He spoke. He came to bear witness to the truth! Isn’t that wonderful Brother Nathanael? You are a winner and you are Gods free Man! Where in the Talmud do you find the quotes alluding to it being ok for a Jew to be a cho-mo as long as the kid is 3 yrs old and a day, because it (the female child ) is as it (the action of doing so) is as they are, NOTHING.